The Bolivian president said socialist governments in South America must launch democratic revolutions to counter U.S. plans to regain control. 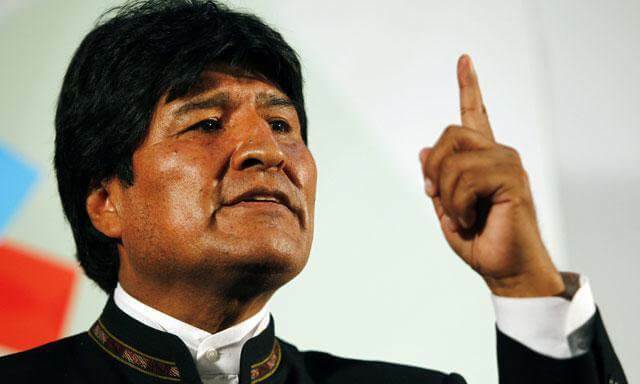 Socialist governments in Latin America must relaunch “democratic revolutions” in order to combat the strategies in play by the United States to regain control of the region, Bolivian President Evo Morales said in an interview aired Monday night. "In some countries it should be like a wake-up call where [governments] must start permanent conferences to relaunch democratic and cultural revolutions for Latin America and the Caribbean [region]," Morales said from Cuba in an interview with Cubavisión. The Bolivian head of state further warned that several socialist governments in the region are facing "a battle against the empire" which has launched a campaign to discredit and destabilize those governments. "It is the plan of the American empire that wants to regain control of Latin America and the Caribbean, and especially in South America, and there surely is an ambition to establish a United States presence in these countries and recover subservient governments as a model, as a system," Molares added. He added, however, that the peoples of the region have a good memory and therefore it is difficult for the onslaught of the right to achieve its objectives. "When the right wing returns to power they will remove the socialist benefits and shrink the state, which will generate a reaction. That is why I think [right-wing governments] are not going to advance this new attack by the United States using oligarchies and the right conservative parties in these countries,” Morales said. His comments come as governments in Venezuela and Brazil face an offensive by U.S.-backed right-wing opposition parties, who are seeking to rollback on many of the socialist and progressive programs and policies implemented by left-wing governments over the years.